Alright, I'm starting to catch up on all these reviews from pre-Christmas... and once I catch up completely I'll have to break my diet every now and then to try some new beers! I found a 6-pack of these (or maybe it was a 4-pack?) at the Bet-R store by the Perkins overpass. There's a surprising beer selection there for such a small local store. 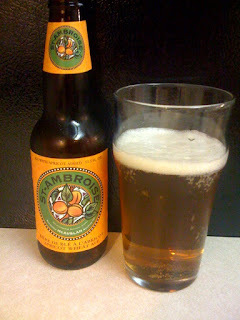 Next up is the St. Ambroise Apricot Wheat Ale. This one comes from McAuslan Brewing up in Quebec, Canada. While a lot of Canadian beer is categorized as 'moose piss' I've found several really good beers from the French Canadian side of the country. Unibroue is certainly the most popular, but they're not alone when it comes to great beer from north of the border. Now on to the beer... you can see the pour, from an 11.2 oz. bottle in to an imperial pint glass. The beer is a clear golden-orange color with a thin white head. Quick to dissipate, lots of bubbles, looks like a lot of carbonation. Almost has more of a cider look to it than a beer, but I'm not all that prejudiced against ciders, so I'll reserve judgment for now. The aroma is strong on the apricot, dominant even. It's not bad, just nothing else there. The taste is a little better balanced, but still dominated by the apricot flavors. There is a little malt up front, but it's quick to be overpowered by the fruit flavors. Light body, lots of carbonation... it's not a bad fruit beer but it's nothing TOO special. Solid and drinkable. I'll definitely give McAuslan another try if I see their beers around town, but I don't think I'll go out of my way for more of this one.